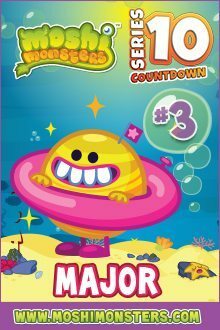 Major and their crew are the soppiest moshlings around though, despite all those teeth, and can be found spinning out of control in their rubber rings around Way-Outta-Sphere while nibbling on as much Space Dust as they can lay their hands on. 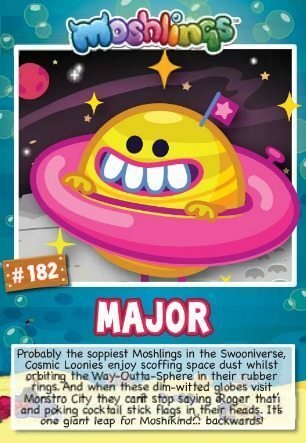 They aren’t the brightest moshlings on the block, and when you see them around Monstro City, you might catch them saying “Roger that” which seem to be Major’s favourite thing to say. Slight annoying really. The appearance of these UFO-ish moshlings mean that we only have a few days to do until the countdown is OVER and we are giving away a complete set of series 10 moshlings. Visit us and subscribe so you don’t miss out.